Had my first laser appointment today and it was absolutely fabulous! I still can't believe that it was literally painless. Samantha was wonderful in letting me know what to expect. I'll definitely be back! Had an amazing pedicure with Samantha at the coxwell location. She took the time to deal with the issues I have with my feet and I can honestly say that yes compared to the regular spa they are a bit pricey but you only get what you pay for. I highly recommend these spas. They use all the right tools and cleanliness is high on there list. Thanks again Samantha. I had a "Joe" pedicure I think it's called. Had excellent service. I'm athletic and my feet get beat up and they were able to rehab my feet nicely! Staff were friendly, offering water or coffee/tea. 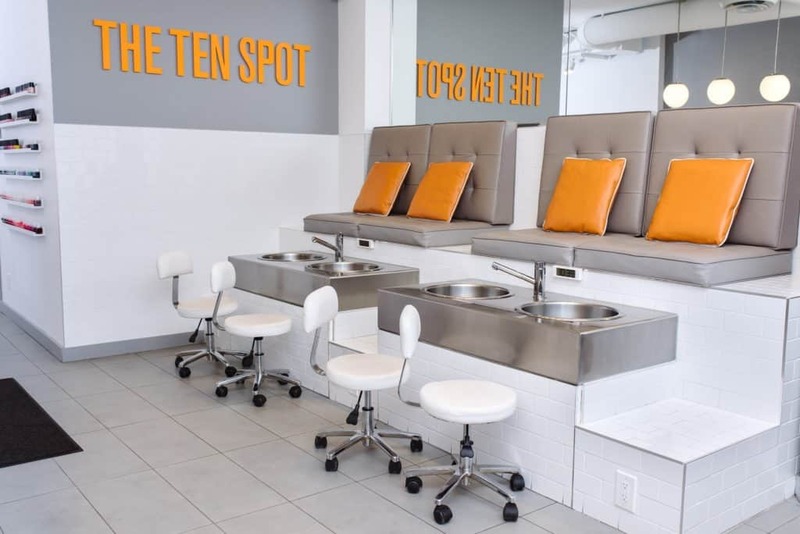 Comfortable seating and staff were very helpful for someone who hasn't had many pedicures in the past. Highly recommend. I really enjoy being pampered here. The last photo on the front drew me in. Today I walked right past The Ten Spot as I didn't realize the change on the front. Btw the "hey gorgeous" is so tiny I had to squint to read it. The sign isn't eye catching at all and the words "turn over a new leaf" makes me feel like I'm not good enough and I need to change. Very negative. On the brighter side...My nails were done by Samantha and she is very professional and my nails have never looked better.Thanks Samantha! I went for my first laser treatment today and it was FANTASTIC!!! I absolutely love Samantha. She made me feel totally relaxed and explained everything clearly and talked to me throughout the session (told me when the laser was going to start, what sensations I might feel, etc). I used the numbing cream sold in store and I did not feel a single thing! Not one thing! This new laser is amazing. And the actual laser treatment only took about 5 minutes total. I'm SO happy I decided to get this done. I already have another appointment booked!